Space shuttle Discovery is seen in cameras as it flies around the International Space Station after undocking for the final time on March 7, 2011 during its last mission, STS-133. This story was updated at 10:38 a.m. ET. HOUSTON – NASA's space shuttle Discovery cast off from the International Space Station for the final time today (March 7), beginning the last leg of its last space voyage nearly 12 years after the prolific spacecraft's first visit to the orbiting lab. Space station commander Scott Kelly rang the bell as Discovery departed after 8 days, 16 hrs, and 46 minutes attached to the orbiting laboratory. "I'm really proud of what we accomplished together as a team on the space station, but also including the larger team in Houston and all the control centers around the world," Kelly radioed to Discovery's crew as the shuttle departed. "The space program, doing something as complicated as this, really takes a team effort. I'd like to wish you guys a safe rest of the flight and safe landing and I'll see you back in Houston in about a week from now." The mission is Discovery's final flight before it is retired later this year along with the rest of NASA's shuttle fleet. Discovery is NASA's most-traveled space shuttle, and is the oldest in service today. "Discovery has been a great ship and has really supported ISS more than any other shuttle -- fair winds and following seas," Kelly wrote in a Twitter post from space as Discovery undocked. This morning, Discovery's crew also received a special wakeup call that was chosen by the public in a contest sponsored by NASA. The astronauts awoke to the "Theme from Star Trek" by Alexander Courage, with a specially recorded introduction by "Star Trek" star William Shatner. The song was the contest's runner-up, receiving the second most number of votes. The winning wakeup song will be played tomorrow morning for the astronauts. Space shuttle Discovery performs its flyaround shortly after undocking from the International Space Station on March 7, 2011 near the end of its final mission - STS-133. After undocking, Discovery backed away to a distance of 400 feet before pilot Eric Boe flew the shuttle on a victory lap around the station, known as a fly-around, before officially departing. "It's a privilege to do the undock and fly-around," Boe said in a news briefing that was held Friday (March 4). "What's amazing is how big the structure is. Majority of the U.S. segment was brought up piece by piece by the space shuttle, which is truly amazing." 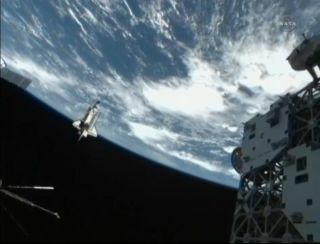 The fly-around is used to inspect the exterior of the station, but it also allows Discovery's astronauts to snap photographs of the completed structure with all the other visiting vehicles: the Japanese HTV-2 cargo ship, the European Space Agency's ATV-2 cargo craft, the Russian Progress cargo ship, and two Russian Soyuz spacecraft. After leaving the space station, the astronauts will use the shuttle's robotic arm to conduct a final inspection of the spaceship's heat shield. The crew will relay data to ground teams here at NASA's Johnson Space Center, to ensure that the shuttle's thermal protection system is in good working order for the orbiter's upcoming re-entry into Earth's atmosphere. Discovery will then spend two days in orbit before landing at NASA's Kennedy Space Center in Florida on Wednesday, March 9. Current weather forecasts show good conditions for Discovery's planned Wednesday landing. Discovery's 13-day STS-133 mission is the shuttle's final flight before it is retired from service. The workhorse orbiter has now made a total of 39 trips into space, including 13 visits to the International Space Station. Discovery was also the very first shuttle to dock to the International Space Station during its STS-96 mission, which blasted off from NASA's Florida spaceport on May 27, 1999. Discovery launched on its final flight on Feb. 24, and arrived at the space station two days later. NASA decided to extend the original mission by two days, giving the shuttle a total of 13 days on orbit. The flight's primary goal is to help outfit the station for the years ahead, when NASA will no longer have the enormous cargo-carrying capability of the space shuttles. NASA has two final space shuttle missions planned – the STS-134 flight of Endeavour in April, and the final STS-135 flight of Atlantis in June.